Zakk Wylde...Lord Of The Dance? Hey, we knew the former Ozzy Osbourne shredder and now full-time Black Label Society kingpin was talented, but apparently he's got other skills, those of the soft-shoe variety, and he's not shy about sharing them with the world. Yes, folks, Zakk Wylde wants to be on Dancing With The Stars. You can't blame it on drink anymore - the man's been off the sauce for over a year now. Wylde is dead serious about his desire to trip the light fantastic on the hit ABC dance-off series (visit his MySpace page - it's all right there), and he wants your help in making his dream a reality. So if you want to witness TV history - and seeing the Zakkster make like Fred Astaire would be just that - head over to ABC.com and cast your vote. 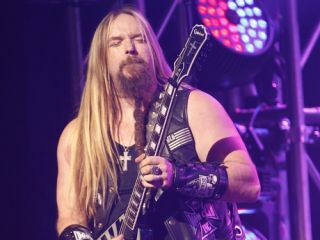 Tell 'em you want to see Zakk Wylde on Dancing With The Stars. You'll be glad you did. Really.